I shared the Just A Card campaign back in September and why we should all shop small and independent this Christmas. Whether it’s a big order or just a small purchase, it makes a big difference to any independent makers and artists. To spread the love and share some of my favourite small biz babes, here are eight small shops that I love and who deserve some extra orders this year. I recently ordered from Annie and it’s safe to say that her packaging and artwork is on point! I love her leafy designs and her particularly pun-tastic cards. The mistletoe pin is perfect as a little Christmas add on, too. If you’re after a larger present, I highly recommend her book ‘House Jungle’. I pre-ordered this from her super successful Kickstarter last year, and it’s a perfect book for any indoor gardeners. Her illustrations are so cute and it looks lovely on the coffee table! Steph runs The Happy Pencil and her illustration and lettering skills are absolutely stunning. Her instagram feed is a constant inspiration for me and she often shares little videos of her process on her Instagram stories. 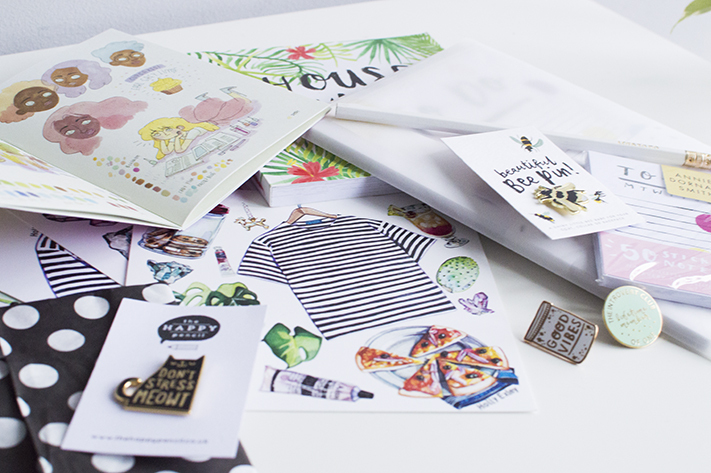 Steph’s shop is full of beautiful A3 & A4 art prints as well as enamel pins and cards. I treated myself to the ‘Don’t stress meowt’ pin but it was a toss up between that and the equally hilarious ‘Donut bother me’ pin. Steph also creates custom letter illustrations which would make the perfect unique gift. I met Laura at the Blogtacular conference back in June and runs Laura Talanti (formerly Diglot etc). Not only is she a lovely and generous person, but her wonderful pins would make the perfect gift. If I had to choose a top three, I’d go for Anxieties Adventures, cat pawprint and the Introvert Club pin I already have. Her Instagram grid is the perfect gallery to see how her pins look together or with others in your collection, and if you love cats, check out her insta stories too. Laura fosters kittens and I don’t know how she manages to not squeal in every video! Rachel runs onr. shop and I’ve been following her journey for years, watching her brand go from strength to strength. Rachel’s shop is perfect for stocking fillers, full of paper goods, pins and patches. Her pins are a personal favourite, particularly the Urban Jungle Kitty pin and the Good Vibes pin that I wear on the regular! I also love her latest patch additions, especially the metallic greenhouse and her colourful jungle patch with Momo the cat hiding in your pocket! Though first and foremost Holly is an artist, her work makes the most beautiful art prints. Holly is a freelance illustrator living in the north of England and her paintings are beautifully detailed. I love her style, and adore the prints I bought from her. She often sells her original paintings so it’s worth keeping an eye out if you’d like the original artwork, as well as following her on twitter for news on more prints, too. I also really enjoy watching her vlogs on Youtube and learning more about veganism. I’ve mentioned Fran a lot on Twitter over the years but I find her so, so inspiring! Fran is also a freelance illustrator originally from Chile, and her business has gone from strength to strength. I bought her ‘Brandford Cereal Girls' zine this year along with her adorable stickers. Fran’s style is so recognisable, extremely fun and wonderfully expressive. Her latest product launch has really taken off and I’m so happy for her! The planner she launched in October has clearly had a lot of thought and effort poured into it, including the tear out vouchers and adorable dust bags. Fran makes a lot of excellent Youtube videos that shares the behind the scenes process of running her biz and processes of her drawings. She seems like the nicest person and her art progression is a real inspiration to me. Liz has been a constant support to me both on Twitter and Instagram, and I value her comments a lot because she really knows what she’s doing! Her lettering is absolutely stunning and her shop contains both prints, cards, pins and stationery. I love the muted colour palette she’s used for her illustrated Christmas cards this year and adore her washi tapes, too. Another lovely internet friend who gives me constant support, Sian is such a lovely person and I feel like her work really reflects her kindness. Whether you’re after cute cards, custom portraits or even wedding stationery, Sian’s style is fun and colourful. Her new penguin desk calendars are particularly wonderful! There are so many wonderful independent artists and makers out there that I’d love to share on here, but I’ve limited it to 8! I find seeing and buying other creative’s work really inspiring and it’s great to see how well people are doing. Sometimes being a shop owner can be daunting and scary, so I think sharing and promoting other shops is not only helpful to them, but also inspiring to me. Seeing other people’s successes only propels me to work harder and achieve all that I’d like to. Please do continue sharing people’s tweets, signing up to newsletters, liking on instagram and of course, buying their products.